What a surprise! As someone who looked upon this collaboration with a great deal of doubt, I've got to admit that I'm really enjoying this album. When Glenn first hooked up with Joe for some gigs in Japan a while back, it seemed a strange move - why potentially put yourself back in a situation akin to that of Deep Purple Mk3? The recordings I heard from the tour seemed to support these doubts, Joe very much the front man, Glenn only getting centre stage for a handful of numbers - it didn't bode well. By the time that the pair's first album came out, I'd heard stories that many of the songs were written to order: "OK JJ, now we need a new 'Sail Away' and, while you're at it, a new 'Stone Cold'." The album failed to impress me. For Glenn, who for so long has been saying he'll no longer be playing the old Purple tunes, this seemed a move that would only make him more reliant upon them. Whatever the remit was for this one though, they've pulled something off here. There's enough good material that should work well live, if only they'll risk dropping some of the old Purple and Rainbow numbers. Revelation (4:09) A strong, up-tempo, riffy opener. Glenn leads the way before Joe grabs the second verse. There's a lot crammed into these four minutes! A good start. Alone I Breathe* (4:15) Twin vocals on this one - wah-wah used to good effect on the guitar solo which follows the Moptop-ish middle section. Good but unexceptional song but could go down well live. Losing My Head (5:28) A strong Zep feel to this one in the verses - the choruses are an anti-climax after this! Guitar solo, I'm told, is courtesy of Steve Vai. Vocals seem to be just Glenn, with a trademark scream or two towards the end. Another good 'un. 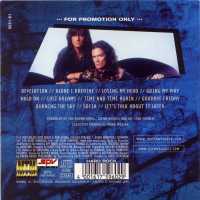 Going My Way (4:26) Seems like another attempt to repeat 'Sail Away' or 'You Can't Do It Right' - "Bad luck and trouble always following me", it could have been written by Coverdale! Hold On (5:28) Not a remake of the Stormbringer track, though the song would suit these two. It starts with some vocal harmonies before we're into another up-tempo one with an interesting verse before it gets into a clichéd bridge, "address unknown...... I'm on my way so don't let go", which leads into the chorus.... or, rather (like 'Alone I Breathe'), just the title, repeated. There's a lengthy guitar solo. Lost Dreams (6:35) Twin vocals again. Lengthy, laid-back chorus which Glenn leads. A promising 'Eastern' guitar solo evolves into something much more mainstream. Time And Time Again (5:46) This is Joe's track. For me, the low-point of the album - how many times can you re-write these Rainbow ballads? Should Blackmore get a royalty? Goodbye Friday* (4:58) The pace goes up a few notches on this one. Glenn takes the lion's share again before Joe starts the second verse. A catchy, taunting 'na-na, na-na-na-na' bridge leads into another clichéd chorus. JJ takes a lengthy and interesting solo. A strong ending. A good one to close a live set with! Burning The Sky (6:14) Starts with a 'Smoke'-like, three-chord riff before dropping down to a couple of mellow verses, with keyboards and acoustic guitar, building to a powerful hook, "I'm learning to fly, I'm burning the sky", closing with a couple of suitably framed guitar solos. The most memorable track on the album. Sofia (4:47) Another up-tempo, riffy track, though unexceptional. Let's Talk About It Later* (5:54) Keyboards, which have been very much in the background until now, take the lead until slide guitar grabs hold of the song which Glenn seems to tackle without Joe. 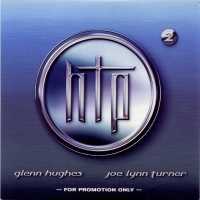 I've been listening to the promo, which is thin on details, but I gather most of the tracks are written by Hughes / Turner / Marsh, though three tracks* are Glenn's. Very 'commercial' in places - but what radio stations play new material from 'Classic Rock' bands anyway? Enjoyable. If only they could stop quoting from the well-worn Book Of Overused Rock And Pop Lyrics. Deep Purple it is not - but it could have been a lot worse, only one track prompting the fast-forward button.